https://sep.yimg.com/ay/yhst-33477391359232/ritteri-anemone-heteractis-magnifica-sea-anemone-bulb-tip-anemome-maroon-anemone-yellow-tipped-long-tentacle-anemone-5.jpgRitteri Anemone - Heteractis magnifica - Sea Anemone - Bulb-Tip Anemome - Maroon Anemone - Yellow Tipped Long Tentacle Anemone Expert Only!!! Taxonomy: Ritteri Anemone belongs to the Kingdom Animalia, Phylum Cnidaria, Family Stichodactylidae, Genus Heteractis and Species magnifica. Scientific names: The scientific name of Ritteri Anemone is Heteractis magnifica. Other common names: Ritteri Anemone is also commonly known as Magnificent Sea Anemone, Heteractis Magnificent Sea Anemone, Maroon Anemone, Red Radianthus, Sea Anemone, Bulb Tip Anemone, Radianthus Anemone and Yellow Tipped Long Tentacle Anemone. Origin or natural range: Ritteri Anemone is found in the Indo-Pacific region, Fiji, the Red Sea and Egypt. Size: Heteractis magnifica may grow up to a diameter of one meter or three feet. 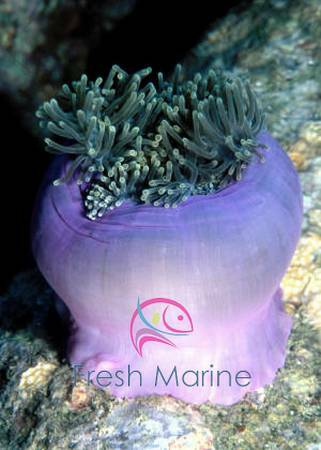 Color: Ritteri Anemone occurs in red, purple, pink, blue, tan, brown, orange and green colors. Compatibility: Heteractis magnifica is aggressive towards the other marine aquarium members. Ritteri Anemone is found solitarily or in loose groups on reef front, in sand or mud. Heteractis magnifica symbiotically hosts clownfish such as Cinnamon, Clarki, Percula, False Percula, Maldives and Pink Skunk to name some. Ritteri Anemone also hosts commonsals and shrimps some times. On perceiving any kind of threat, Heteractis magnifica buries itself completely under the sand in its habitat. Ritteri Anemone is the least hardy of all the Anemones community. The oral disc of Heteractis magnifica is well populated with around eight centimeters long, finger shaped, green or brown colored tentacles, which are slightly swollen at tips at times. The purple, green, red or brown colored column of Ritteri Anemone has vertical rows of verrucae. The column can close in entirety assuming the shape of a ball. Water flow in the aquarium: Ritteri Anemone requires very strong but intermittent water current in the marine aquarium it inhabits. Illumination: Heteractis magnifica needs high intensity lighting in the reef aquarium hosting it. To keep Ritteri Anemone, you should have reef-type marine aquarium with sand, coral rubble, gravel, coral and rock in it. Position Heteractis magnifica high in your marine aquarium. The Anemone, however, may move around till it gets a suitable place to settle down. Keep Ritteri Anemone far off the other members of your marine aquarium as the Anemone may sting them upon contact. Heteractis magnifica grows rapidly under favorable environmental conditions. Ritteri Anemone generally grows to a diameter of around 1.50 feet in a marine aquarium. Heteractis magnifica derives its nutrition primarily through photosynthesis which is performed by zooxanthellae, an acellular photosynthetic alga living symbiotically within the Anemone. Ritteri Anemone is Carnivorous in feeding habit and filter feeds a few times per week, when open. Heteractis magnifica eats fish, crustacean, krill, mussels and frozen meaty bits of other vertebrates and invertebrates. Keep the nitrites and nitrates level in the aquarium water at zero. Add Iodine and trace elements as dietary supplements for Ritteri Anemone. It is very difficult to maintain Ritteri Anemone. The nitrites and nitrates level in the water must be kept at zero. The raised levels may prove lethal for Heteractis magnifica. Caution: The sting of Ritteri Anemone is powerful. Therefore, keep the Anemone well away from the other marine aquarium members.